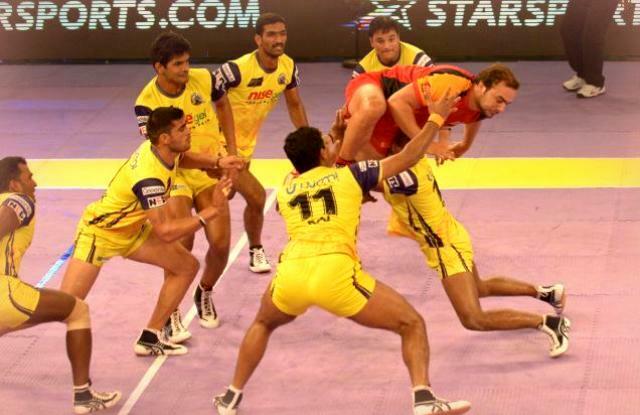 Home Bangalore Bulls Breaking Games Latest Pro Kabaddi Semifinal 2015 Sports Taaza Telugu Titans What a MATCH, Bangalore Bulls WON the MATCH.... Telugu Titans WON people HEARTS !!! 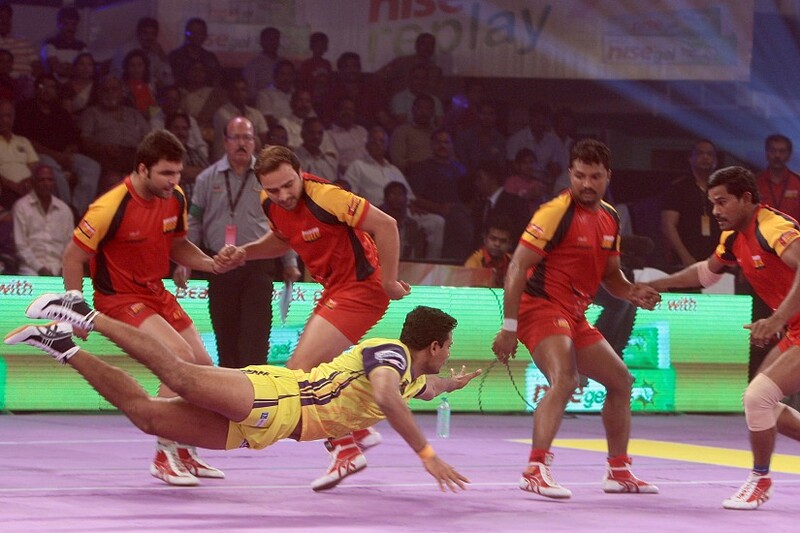 What a MATCH, Bangalore Bulls WON the MATCH.... Telugu Titans WON people HEARTS !!! 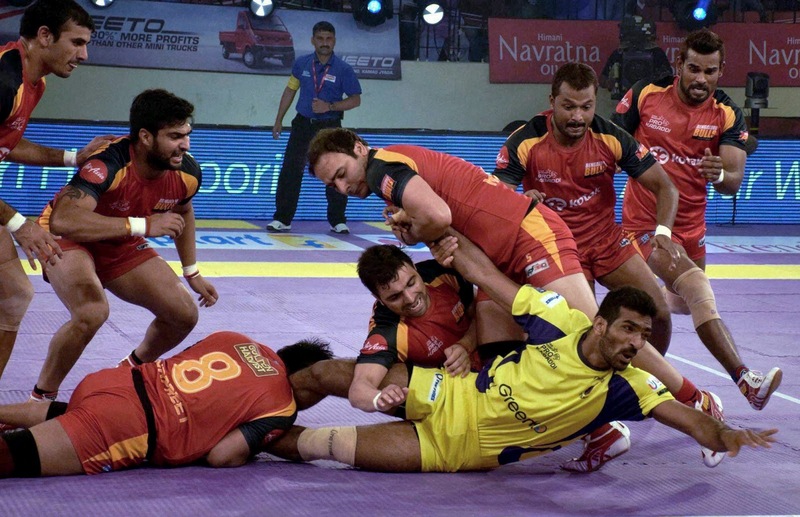 Bengaluru Bulls staved off a late fight back from their southern rivals Telugu Titans from Hyderabad to chalk out an exciting 39-38 victory and enter the final of the Pro Kabaddi League at the NSCI Stadium here on Friday. Putting on a very impressive show in both attack and defense, the Bulls simply blew away their rivals after the first five minutes and were racing away to a thumping victory. But the Titans made a late surge to cut the Bulls' commanding 16-point lead to just one point when the winning team's captain Manjeet Bullar made a successful raid and made it 39-37 with the last few seconds remaining. The Titans got one more point through Rahul Chaudhari's successful last-gasp effort to go down to the Bulls for the third time this season. When the Titans caught up with their rivals 4-4 after the fifth minute and then at 8-all it looked as if a good fight would ensue. A foot injury to his rival counterpart, Meraj Sheykh of Iran early in the game was a big blow for the Titans and by the time he came back in the second half the Bulls had taken firm control of the game. Then the Bulls simply pulled away to lead 16-10 at half time and then did not take their foot off the pedal in the second half to take a commanding 31-15 lead with eight minutes remaining on the clock. The Titans slowly and surely narrowed the deficit with some super tackling before losing the contest narrowly. The two all outs they suffered proved very costly in the end. Captain Manjeet Chillar led from the front for the Bulls by tallying 8 points and he was very well supported by his deputy Ajay Thakur (8) in attack and some excellent tackling by Dharmaraj Cheralathan (9 points, including 6 in tackling). For the Titans, Sandeep came back strongly in the second half to garner ten points, including six in defence, while Chaudhari secured 9 raid points. Deepak Hudda did his bit in attack and defence to garner 6 points. Substitutes Rupesh Tomar, Prashant Rai and Rohit Baliyan helped the Titans make a fight back with some valuable points. "We got overconfident but we also knew we would win," said Bulls? skipper Chillar after the game. Bangalore Bulls WON the MATCH.... Telugu Titans WON people HEARTS !! !